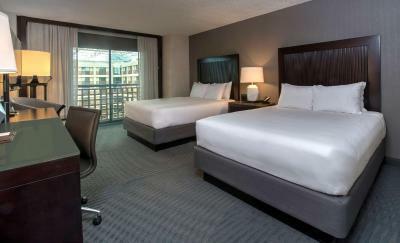 Lock in a great price for Hyatt Regency San Francisco Airport – rated 8.5 by recent guests! Traveling alone for a funeral, I was well taken care of and everyone was helpful. Beautiful room and bathroom. Comfortable bed. I like that there were lots of outlets. Motion activated night lights under the nightstands. Dimmers on bedside lamps. Very thoughtfully appointed room. Very large room. The gentleman working was kind to me after the woman was so rude. Is clean and comfortable, I was able to rest after a long day of flying and needed to be ready early to finish my last leg of the trip, so only used it for a few hours but it was heaven. Used the Hotel Free Shuttle, it was really efficient (arrived after midnight so it runs every 30 mims) it runs more often during the day, just follow the Hotel Shuttle signs ln SFO and you are golden! Great service. Breakfast was delicious. Offered us coffee to go. So nice. Close to the airport. Used the shuttle. Overall, seemless and pleasant. Restaurant was excellent! Great food and an entertaining bar. Spectacular breakfast buffet. Excellent disbursement of rooms so that they are quieter. Excellent staff especially in banquets with ?Natalie? and ?Angelica? I think were there names. Super clean rooms. Hyatt Regency San Francisco Airport This rating is a reflection of how the property compares to the industry standard when it comes to price, facilities and services available. It's based on a self-evaluation by the property. Use this rating to help choose your stay! 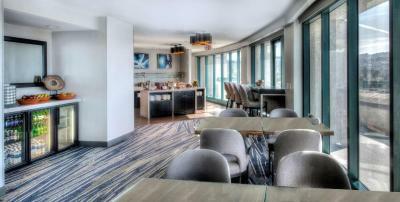 Located in Burlingame, Hyatt Regency San Francisco Airport is 100% nonsmoking and is 15 mi from San Francisco. It offers 24-hour shuttle services to San Francisco International Airport, located 5minutes away, and an on-site restaurant. 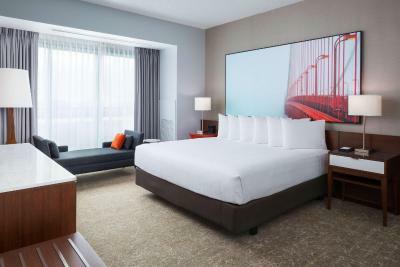 Offering free Internet access, rooms at the Hyatt Regency San Francisco Airport include a refrigerator and coffee maker. Every room has cable TV and climate control. The San Francisco Hyatt Regency features a 24-hour fitness center and business center. Guests can get area information at the tour desk or go for a swim in the outdoor pool. The San Francisco Airport Hyatt Regency features 3SIXTY Bar and Bistro, which features classic American bar menu options, cocktails, and flat-screen TVs. The Bistro serves breakfast, lunch, and dinner. The Market serves healthy snacks, light breakfast, and hot and cold beverages. The Hyatt Regency Airport San Francisco is 20 mi from the Golden Gate Bridge. Fisherman’s Wharf is 18 mi from the hotel. This property also has one of the top-rated locations in Burlingame! Guests are happier about it compared to other properties in the area. This property is also rated for the best value in Burlingame! Guests are getting more for their money when compared to other properties in this city. 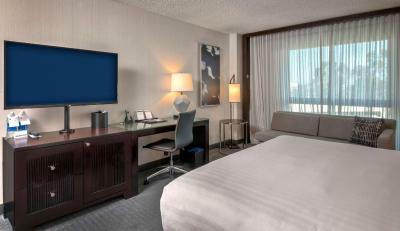 When would you like to stay at Hyatt Regency San Francisco Airport? Offering free WiFi and an ergonomic workstation, this disability access room features a 49-inch HDTV, black out shades and a private bathroom with granite counter-tops. Private parking is available on site (reservation is not needed) and costs USD 30 per day. Located on the 2nd floor, this suite offers a view of the Atrium or exterior, and includes a living room, a spacious work area, a 55" HD TV with cable and satellite channels, stereo system, an in room safety deposit box, a refrigerator, a coffee machine, and an private bathroom with premium toiletries. This room type includes complimentary high speed internet access and daily breakfast for one. This room also includes bottled water. Offering free breakfast, this club access room offers a flat-screen TV with cable channels, a coffee machine, an in room safety deposit box, a refrigerator,and an private bathroom. 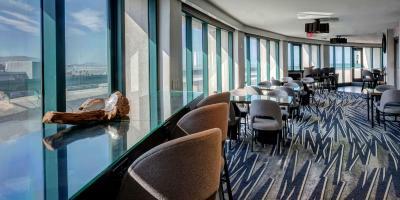 Offering free breakfast and a panoramic view of San Francisco, this club access room offers a flat-screen TV with cable channels, a coffee machine, an in room safety deposit box, a refrigerator,and an private bathroom. Offering free WiFi and an ergonomic workstation, this room features a 49-inch HDTV, black out shades and a private bathroom with granite counter-tops and a shower with dual shower heads. Offering free WiFi and an ergonomic workstation, this king room features a 49-inch HDTV, black out shades and a private bathroom with granite counter-tops and a shower with dual shower heads. Offering free WiFi and an ergonomic workstation, this queen room features a 49-inch HDTV, black out shades and a private bathroom with granite counter-tops and a shower with dual shower heads. 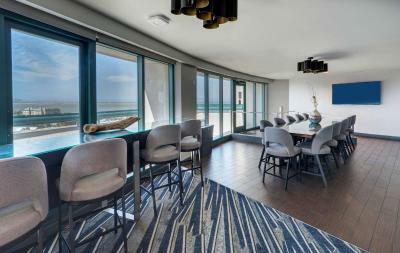 Offering free WiFi and an ergonomic workstation, this high floor room features a 49-inch HDTV, black out shades and a private bathroom with granite counter-tops and a shower with dual shower heads. Offering free WiFi and an ergonomic workstation, this high floor king room features a 49-inch HDTV, black out shades and a private bathroom with granite counter-tops and a shower with dual shower heads. 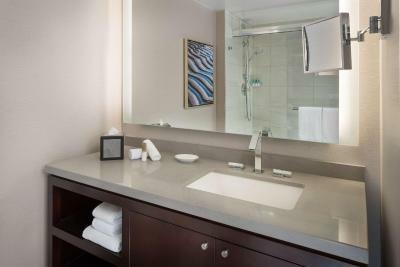 This ADA room features a 49-inch HDTV, black out shades and a private bathroom with granite counter-tops and a bathtub. This spacious suite offers a separate living area with multiple flat-screen TVs, a coffee machine, a refrigerator, air conditioning, and an private bathroom. House Rules Hyatt Regency San Francisco Airport takes special requests – add in the next step! Any additional older children or adults are charged USD 25 per person per night when using existing beds. Hyatt Regency San Francisco Airport accepts these cards and reserves the right to temporarily hold an amount prior to arrival. The property offers self and valet parking. Charges may vary, and will apply to the guest room account. Please contact property for pricing. Parking for RVs/trailers is available. There is an additional charge per night, per axle. Please contact property for details. Unfriendly staff and no kettle to make a cup of tea! Really comfy bed , nice hotel generally, spacious room. Bath towels little tired. Low shower water pressure. Shower head challenge to run. loved the cleanliness and the room. Free shuttle from airport. Lovely comfy beds. Staff so friendly. Restaurant was somewhat open and vacuous. Good buffet breakfast. Comfortable room. My red eye flight was delayed 10hrs and I was traveling with my 2 and 4 year old alone. We showed up at 1 am on 3/26th. I booked my room on March 26th for March 26. When I arrived the woman helping me was horrible and rude. She got angry with me because I didn’t book the room for 3/25, although 3/25 was over and done. I had to jump through all these hoops and was treated like I was stupid for not booking a room for a day that was already over.